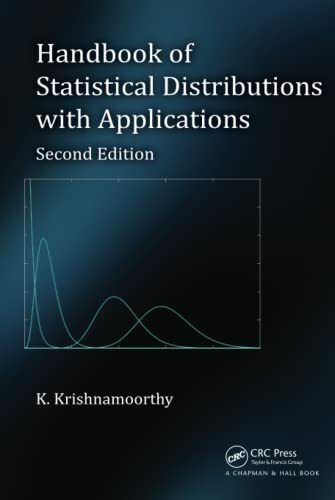 [PDF] Handbook of Statistical Distributions with Applications, Second Edition (Statistics: A Series of Textbooks and Monographs) | Free eBooks Download - EBOOKEE! Description: Easy-to-Use Reference and Software for Statistical Modeling and Testing Handbook of Statistical Distributions with Applications, Second Edition provides quick access to common and specialized probability distributions for modeling practical problems and performing statistical calculations. Along with many new examples and results, this edition includes both the authorâ€™s StatCalc software and R codes to accurately and easily carry out computations. New to the Second Edition Major changes in binomial, Poisson, normal, gamma, Weibull, exponential, logistic, Laplace, and Pareto distributions Updated statistical tests and intervals based on recent publications in statistical journals Enhanced PC calculator StatCalc with electronic help manuals R functions for cases where StatCalc is not applicable, with the codes available online This highly praised handbook integrates popular probability distribution models, formulas, applications, and software to help you compute a variety of statistical intervals. It covers probability and percentiles, algorithms for random number generation, hypothesis tests, confidence intervals, tolerance intervals, prediction intervals, sample size determination, and much more. No comments for "[PDF] Handbook of Statistical Distributions with Applications, Second Edition (Statistics: A Series of Textbooks and Monographs)".